More than a century has passed since the last catastrophic volcanic eruption in Central America. In 1902, the Santa María Volcano in Guatemala erupted, devastating more than 150 square kilometers and causing 2,000 to 3,000 direct fatalities. Although subsequent regional volcanic activity has been relatively mild, more powerful eruptions certainly will occur in the future. Volcanoes located in densely populated areas, however, need not have powerful eruptions to produce disastrous results. General population growth and migration from the countryside to urban centers, many of which in Central America are in close proximity to volcanoes, create ever-increasing exposure of people to volcano hazards. From the Illopango Caldera looking northwest, Volcán San Salvador looms over the city of San Salvador, population 1.6 million. Photo by James Vallance, USGS. Central America is not alone; other regions at risk from volcanic eruptions face similar population changes. To address these large populations living near volcanoes, we have developed a Volcano Population Index, or VPI, to make objective estimates and comparisons of the number of people at risk from volcanic hazards. Within a given radius of a volcanic vent, the index quantifies one component of risk  population  from one volcano to another. Knowing the number of people potentially at risk from volcanic activity allows non-volcanologists and emergency managers to gauge the potential adverse impact of volcanic unrest and plan accordingly. Moreover, knowledge of which volcanoes pose the greatest proximal threat can help prioritize hazard assessment, monitoring and mitigation measures. Even small- to moderate-sized eruptions may constitute severe threats if they occur near urban or other densely populated areas. As with most other hazardous geophysical events, such as earthquakes, the consequences of a volcanic eruption depend on its magnitude and what is at risk. And as with other hazards, we can assign a magnitude of effects to the risks. The Volcano Explosivity Index, or VEI, is a measure of eruption magnitude, similar to the Richter Scale for earthquakes. Created by Chris Newhall and Steve Self in 1982, the VEI is a scale from 0 to 8 of increasing explosivity based on a number of factors, including volume of tephra, column height and eruption duration. Each number represents an approximate factor of 10 increase in explosivity; population is irrelevant. Unlike for many natural hazards, however, we can anticipate the locations of volcanic eruptions as well as the populations at risk. Because eruptions also have precursory unrest and generally can be forecasted, effective mitigation of volcanic hazards is often possible by temporarily evacuating the population at risk. In proximal areas, the time between eruption onset and the resulting hazard  for example, pyroclastic flows, ballistic projectiles and lahars (large mudflows)  is often measured in seconds to minutes. VPI is an effort to quantify the risk based on population in order to facilitate mitigation. It is an outgrowth of the Volcano Disaster Assistance Program (VDAP) in connection with recent work in Central America. VDAP is jointly funded by the U.S. Geological Survey (USGS) and the U.S. Office of Foreign Disaster Assistance. Specifically, the VPI was developed to objectively determine populations at risk living around the 80 active volcanoes in Central America. We are now extending the VPI calculations to other volcanic regions, including the United States, to produce a global summary. Two key tools used in developing the VPI are the LandScan population database, created at the Oak Ridge National Laboratory, and volcano coordinates from the Smithsonians Global Volcanism Program, both available online. LandScan is a gridded global population database with a resolution of approximately 1 kilometer. Best available census data are distributed within census tracts based on land cover, proximity to roads, slope and nighttime lights. In our pilot study of Central America, we reviewed the Smithsonian volcano coordinates to ensure that calculations of the VPI from some of the more complex volcanic systems used the most appropriate vent or vents. To create the VPI, the volcano coordinate data are circumscribed by 5- and 10-kilometer radii (VPI5 and VPI10 respectively). The resulting circular areas intersecting with the LandScan grid yield the estimated included population. We chose 5- and 10-kilometer radii for the VPI to address risk from small- to moderate-sized eruptions that occur most frequently and thus the eruptions that emergency responders and civil authorities will most likely have to face. A review of the global magnitude-frequency relation for volcanic eruptions by Tom Simkin and Lee Siebert in 1994 shows that VEI 2 eruptions occur somewhere on Earth every few weeks on average. VEI 3 eruptions occur several times a year; VEI 4 eruptions occur once or twice a year; VEI 5 eruptions occur about once per decade; and VEI 6 eruptions about once or twice per century. The VPI is specifically designed to be most useful in the VEI 2 to VEI 4 range. Even small VEI 2 eruptions may produce hazardous phenomena, such as ballistic projectiles or tephra fall, that warrant evacuation of populations within 5 kilometers; most VEI 5 eruptions and some larger VEI 4 eruptions will usually involve evacuation within or beyond 10 kilometers. The precise outcomes of ongoing volcanic unrest can rarely be forecasted with any certainty. Not all episodes of volcanic unrest culminate in an eruption, and, for those that do, scientists are generally not able to anticipate changes in the eruption course, such as a sudden escalation, that would pose a significant threat to nearby populations. Thus, volcanologists can only give an imprecise range of the magnitude and style of eruption to expect, typically based on knowledge of a volcanos prehistoric and historical eruptive history. This problem is particularly acute if eruptions have been infrequent or entirely prehistoric. Our use of simple circles with 5- and 10-kilometer radii is supported by a couple of independent lines of evidence. In 2002, Newhall and Rick Hoblitt published in the Bulletin of Volcanology a global compilation of eruption effects with distance and assigned exceedance probabilities of severe hazards for VEI 3, 4 and 5 eruptions reaching various distances. For small- to moderate-sized eruptions, severe hazards will reach only 5 to10 kilometers from a vent. We also reviewed recent evacuations made in response to small to moderate volcanic activity in Central America to ascertain what distances from the volcano people were typically evacuated. For 15 separate small to moderate eruptions (maximum VEI 4) at six different volcanoes, the distances evacuated were always 4 to 10 kilometers away, generally involving areas downwind from the volcano. Thus, given the uncertainty of style and magnitude of a potential eruption, people within 5 kilometers of any threatening volcano almost certainly will be evacuated until the eruption settles into a well-characterized pattern or ceases altogether. People within 5 to 10 kilometers of a threatening volcano may be evacuated, depending on local conditions. For small- to moderate-sized eruptions, VPI5 and VPI10 numbers can provide authorities with a reliable estimate of the minimum numbers of people that may need to be evacuated and cared for, should the volcanic unrest culminate in an eruption. Central America has 30 historically active volcanoes; for this region, recorded history dates back to the early 1500s. Calculation of the VPI10 in the region indicates that approximately 2.7 million people in Central America have potentially significant exposure to volcano hazards. 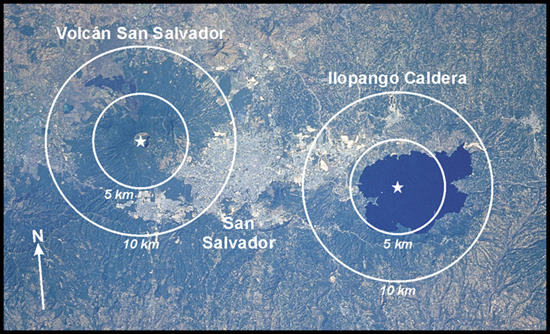 The city of San Salvador is sandwiched between two volcanoes, Volcán San Salvador and Ilopango Caldera, as shown in the Space Shuttle photo above. The 5- and 10-kilometer-radius circles outline the areas used in calculating Volcano Population Index (VPI) for each volcano; stars indicate the site of the most recent eruptions at each volcano. Looking at LandScan populations around the two volcanoes (below) and calculating a VPI, volcanologists can help communities better prepare for evacuation. Each LandScan cell is approximately 1 square kilometer. Top: Base photo courtesy of Earth Sciences and Image Analysis Laboratory, NASA Johnson Space Center. Bottom: Courtesy of John Ewert. Compared to some other volcanic regions of the world, Central America stands out in terms of the sheer numbers of people living in close proximity to historically active volcanoes. Our preliminary analysis of other volcanic regions suggests that only Indonesia has more people at risk. But, Indonesia has many more historically active volcanoes  about 2.5 times the number in Central America. In Central America, however, urban areas are closer to active volcanoes. Use of the VPI allows scientists to identify those volcanoes where even relatively small eruptions may result in a disproportionately huge disaster. San Salvador area, El Salvador. Not surprisingly, El Salvador has the largest number of people living near active volcanoes; it has one of the highest population densities in the western hemisphere. 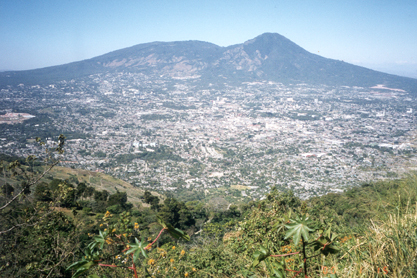 The capital city, San Salvador, is a large urban area with well-known, historically active volcanoes anchoring the eastern and western ends of the city. On the eastern end of the city is Ilopango, a silicic caldera that produced a powerful eruption (VEI 6) in approximately A.D. 429 that devastated much of what is now modern El Salvador and had a profound impact on the Mayan civilization. Ilopango was again active in 1879-1880, when a mostly nonexplosive eruption extruded lava domes into the caldera lake. On the western end of the city sits Volcán San Salvador, a complex andesitic system with many potentially active vents oriented southeast to northwest within about 10 kilometers of its main vent, Boqueron. The most recent eruption of Volcán San Salvador occurred in 1917. Of the nearly 1.4 million Salvadorans within 10 kilometers of a historically active volcano, 80 percent live within 10 kilometers of Volcán San Salvador and Ilopango. 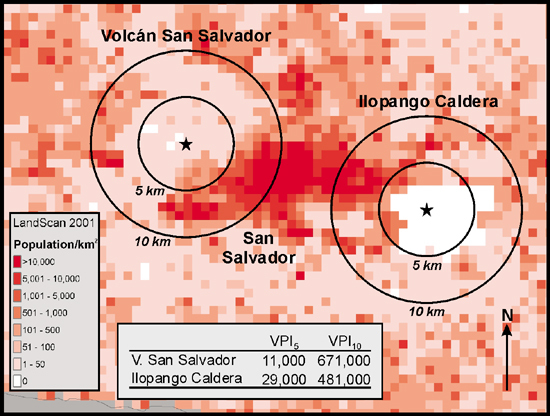 Thus a moderately explosive eruption from either of these volcanoes would have a large impact on the city of San Salvador and, because it is the capital and commercial center of El Salvador, on the entire country. Both volcanoes are seismically monitored by the Servicio Nacional de Estudios Territoriales, and Volcán San Salvador has been the subject of several hazards studies. A hazards assessment of Ilopango is in preparation. Quetzaltenango area, Guatemala. VPI calculations indicate that in Central America, Guatemala ranks second in the number of people within 10 kilometers of a historically active volcano. Surprisingly, more than half of these people are threatened by a single, little-known volcano, Cerro Quemado, in the highlands of Guatemala. Cerro Quemado does not have a classic volcanic cone shape like its more famous neighbor Santa María; it lies behind the volcanic front and is a small complex of coalescing domes and lava flows with a total volume of about 2 cubic kilometers. The most recent eruption occurred in 1818, when it produced a large trachyandesite lava flow. Approximately 700 years prior to the 1818 eruption, Cerro Quemado produced a small debris avalanche (a smaller version of the event that occurred in 1980 on Mount St. Helens) that was followed by a lateral blast and pyroclastic flows, which devastated at least 40 square kilometers to the northwest. But what makes Cerro Quemado truly exceptional is its proximity to Quetzaltenango, the second largest city in Guatemala. More people live within 5 kilometers of Cerro Quemado than any other historically active volcano in Central America. Although the volcano does not appear to have been frequently active, it is a young system that tends to erupt explosively. At the present time, there is no seismic monitoring of the volcano and the nearest seismic station is approximately 10 kilometers away, near Santiaguito, the currently active vent on the south side of Santa María Volcano. In cooperation with VDAP, the Instituto Nacional de Sismología Vulcanología Meteorología e Hidrología and the Coordinadora Nacional para la Reducción de Desastres will be installing a seismic station to monitor Cerro Quemado this year. Although the VPI does a good job of estimating the number of people who are potentially at risk from fast moving, severe volcanic hazards, it gives only a minimum estimate. Even the VPI10 will underestimate the number of persons at risk from many VEI 4 eruptions and all larger eruptions, as well as eruptions from snow- and ice-capped volcanoes, which can produce lahars that may travel 100 kilometers or more. In regions such as South America, North America and Japan, where primary lahar hazards can be severe, lahar-hazard zones extending beyond 10 kilometers obviously need to be considered. In such cases or when a more accurate evaluation of population at risk at an individual volcano is needed, the LandScan database can be used in combination with a hazard-zonation map to produce a suite of population risk estimates based on a variety of possible scenarios. The 1-kilometer grid size of the current release of LandScan is the principal limiting factor in making precise estimates of population at risk. Nevertheless, the VPI is useful for estimating minimum numbers of people that may need to be cared for during an eruption. Moreover, as a communication tool, the VPI can effectively convey the magnitude of risk in terms that are easily understood by nonscientists (for example, emergency managers, affected populace and journalists). We will continue to use the LandScan database and to refine the VPI in our efforts to reduce risks from volcano hazards. Ewert is a USGS volcanologist based at the Cascades Volcano Observatory in Vancouver, Wash. He has worked with the Volcano Disaster Assistance Program since its founding in 1986. Harpel is also a USGS volcanologist based at the Cascades Volcano Observatory. He has worked with the Volcano Disaster Assistance Program since 2001. Dobson, J.E., Bright, E.A., Coleman, P.R., Durfee, R.C., and Worley, B.A., 2000, Landscan: A global population database for estimating populations at risk: Photogrammetric Engineering and Remote Sensing, v. 66, no. 7, p. 849-857. Dull, R.A., Southon, J.R., and Sheets, P.D., 2001, Volcanism, ecology, and culture: a reassessment of the volcán Ilopango TBJ eruption in the souther Maya realm: Latin American Antiquity, v. 12, no. 1, p.25-44. Newhall, C.G. and Hoblitt, R.P., 2002, Constructing event trees for volcanic crises: Bulletin of Volcanology, v. 64, p. 3-20. Newhall, C.G. and Self, S., 1982, The volcanic explosivity index (VEI): an estimate of explosive magnitude for historical volcanism: Journal of Geophysical Research, v. 87, p. 1231-1238. Simkin, T., and Siebert, L., 1994, Volcanoes of the World: Geoscience Press, Tucson, 349 p.